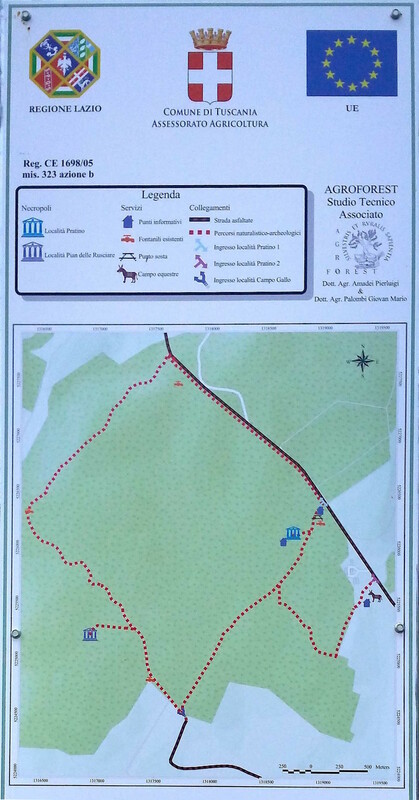 The Etruscan necropolis of Pratino is located on a flat area, on the eastern edge of Macchia della Riserva, and has been identified as a result of a field survey, which also established that an intensive activity of illegal excavation was perpetrated by violators. Nevertheless, the field survey highlighted the presence of funerary contexts practically intact and has allowed the acquisition of new data regarding the distribution, the typology and the history of the tombs. The funerary structures are densely arranged along two main axes, east-west and north-south, intersecting and sometimes even overlapping with each other. In particular, some pit tombs and vertical loculi (or shaft tombs), occupy the spaces between the chamber tombs, arranged with a different orientation in relation to the latter. This aspect, together with the grave goods, may indicate an earlier frequentation of the necropolis, which, as a whole, has developed during the Hellenistic period up to the the early Roman Empire. The intensive exploitation of this cemeterial area appears to be confirmed by the use of the same room to house primary context depositions all the way in the inner corridor or in secondary context, in the vertical walls of the platforms, by creating small niches used as ossuaries. The typology and the dimensions of the funerary structures are very different. Among the underground chamber tombs, are included some large to medium-sized examples, with a central inner corridor flanked by two large platforms organized in horizontal loculi (Nos. 20, 21, 22, 25, 44 A); other examples are smaller in size, designed for nuclear families, with simple platforms along the walls (Nos. 23, 28, 32, 37, 47); while others are for the use of one individual, with a single platform (n. 26) or even without any (n. 27). In some cases, the loculi are realized in the walls of the access corridors to the rooms (Nos. 20, 22, 37). Other tomb typologies are rectangular pit tombs (Nos. 24, 30, 31, 35, 48), sometimes covered with tiles, and vertical loculi (Nos. 29, 36, 45). Although the predominant ritual is that of inhumation, in the rooms were also found cinerary urns, housed in specific niches. Also several lithic cippi were recovered, which functioned as tombstones. Underground chamber tomb with an elliptical elongated plan, preceded by a corridor, without steps, in which were realized three loculi. The ceiling collapsed in antiquity, which has allowed the preservation of almost all of the grave goods. The entrance to the room was still closed with its original door. The internal space is divided by a central corridor, which separates two large deposition platforms arranged on the long sides, divided by curbs in horizontal parallel loculi, nineteen in number within the west platform and eighteen within the east platform. The loculi were meant for the burial of individuals, of which only a few bones and teeth were preserved, positioned with their heads towards the internal corridor. Near the entrance, a niche was carved for a cinerary urn, which raises to forty the total number of depositions of the tomb. Seven loculi on each platform were covered with tiles laid flat, on top of which were deposited the grave goods. For the other loculi we can assume in origin the use of wooden coverings, no longer preserved. The total amount of discovered objects is more than five hundred. There are numerous bronze vessels, including two in the shape of resting wineskins, jugs, bowls and a frying pan. Among personal ornaments were found a few bronze bracelets and a digital silver ring with glass bezel. The presence of a few bronze mirrors indicates the female ownership of some of the burial loculi. Among the objects in iron, was found a dozen strigils (scrapers), which can be linked to masculine type of activities as athletics or to male and female toiletry, and three spear cusps, which represent the only weapons among the grave goods. Quite numerous are the ceramic vessels for table use, red or black painted or achromatic, and balsam jars. A consistent number of oil lamps, always in terracotta, painted also in black, were recovered. 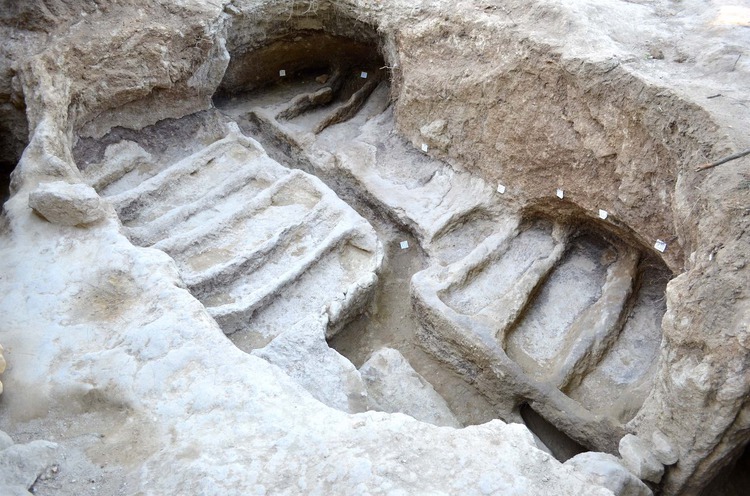 Most of the finds indicate this tomb as belonging to an advance phase of the Hellenistic period, with a possible extension up to the early Roman Empire. The tomb has an underground chamber with an open-air entrance corridor. The ceiling of the chamber collapsed in antiquity, preserving almost entirely the grave goods from violations. An entrance corridor leads to the chamber; one of the stone slabs that closed the access is still visible in situ. The inner walkway follows the orientation of the corridor; it is flanked on both sides by rectangular loculi bordered by tufa curbs. On the eastern side are eight loculi; the western part of four of them was damaged by a modern intervention, apparently by a mechanical excavator; bones of bovine were found within, perhaps intentionally discharged. On the western side there are: a narrow shelf for one deposition, four rectangular loculi, and another small shelf for two incinerations; from here a large portion of tufa has been left on this side of the walkway, giving the room an irregular shape. Some human bones have been found in the walkway side of the loculi, including lower extremities and teeth. The grave goods consisted in more than sixty objects, mostly intact. Among the bronzes, a mirror with incised decoration representing the Dioscuri couple, dated back to the 3rd century BCE, and a burner for solid aromatic substances (thymiaterion). Among the black glaze pottery, are noteworthy a cup with ear-shaped handles, two double-handled cups (kantharoi) and a chalice, dated between the second half of the 3rd and the 2nd centuries BCE; also a small jug and a tall cup must be mentioned. Also some fine ware wine jugs (lagynoi) and pots are present. Tomb 25 is an underground chamber burial. A deep and steep entrance corridor leads to a coaxial inner walkway; on its sides there are two wide platforms respectively divided in seven and eight loculi and a small shelf of irregular shape. The loculi are perpendicular to the walkway, but irregular in shape and dimensions; the division curbs in some cases are not preserved, due to one or more interventions of violation. The tomb contained a few fragmentary grave goods (ceramics and metals), including pieces of the disc of a bronze mirror and an iron nail. A rectangular trench tomb (nr. 30) was realized at the top of the entrance corridor. The nearby Tomb 32, an underground chamber of modest size, has its entrance at a lower level than that of Tomb 25. On both sides of the inner walkway, in axis with the short entrance corridor, there are two platforms for one and two depositions. The ceiling of the room is damaged by a breakthrough opened in the thin diaphragm of rock between this structure and an upper burial, Tomb 36. A rectangular trench tomb originally covered with tiles (nr. 31) was found not far from Tomb 32. Tombs 24 and 35 are two rectangular trench burials separated by a stone and two roof tiles fixed vertically in the ground. Tomb 24 returned three ceramic grave goods: two achromatic jars and a wineskin-shaped vessel with two spouts. This type of vessel is fairly widespread in Etruria and some scholars consider a few examples as strongly connected to childhood. This might be the case since were discovered a few small balls of clay inside a cavity in the foot of the vessel, which may identify these as rattle-feeding bottles. Vertical loculus tomb with an entrance corridor preceded by two steps. The loculus has a deposition platform located at a slightly higher level of the walkway, which was probably closed by stone slabs, one of which is still in situ; other lithic blocks were present but were not in their original arrangement, probably due to subsequent violations. The tomb featured a few fragments belonging to ceramic vessels, including a few sherds covered with black glaze. Quadrangular structure not very deep, difficult to frame due to its unusual shape and to the violations that have been conducted. However, the presence of some ceramic sherds (achromatic, black-painted and thin-walled) does not exclude its interpretation as a pit grave. Hypogeum tomb with a corridor with steps. The entrance, marked by the bottom part of the door, a slab of nenfro still in situ, introduces to a small room with a semi-elliptic short interior walkway and U-shaped deposition structure. The ceiling is collapsed. On the right wall, at the beginning of the room, there is a hole that connects with the adjacent tomb, perhaps due to the passage of the burrow of an animal. The objects found are relevant to the funeral set, including a achromatic ceramic jar, a black painted bowl found in the walkway, and a few other fragments of ceramic pottery (achromatic, black paint and thin-walled) and metal (bronze and iron). Hypogeum tomb introduced by an access corridor with a lowered arched entrance that no longer retains its closure elements. The small rectangular room with low ceiling most probably had to accommodate a single burial deposition, the funerary set of which was found in secondary context and featured fragments of iron and black painted and achromatic ceramic pots. The tomb also yielded three fragmentary lithic cippi, two of which column-shaped. Underground burial chamber with a steep access corridor in which was obtained a vertical loculus. The chamber has a rectangular plan and lowered vaulted ceiling. The interior walkway is flanked, on the right by a deposition platform divided into ten parallel loculi bordered by curbs. On the left, near the entrance, was created a vertical loculus. The tomb, violated, featured fragments of achromatic and black and red painted pottery and a bronze nail. Hypogeum tomb with a rectangular plan. Inside were discovered a U-shaped deposition platform with the ceiling completely collapsed. The corridor leading to the grave was not excavated due to the presence of a large tree. Nevertheless, it was possible to highlight a stone slab of rectangular shape, which constituted part of the original sealing. The back wall was partially damaged by the construction of the nearby T45. The ceramic material found relevant to the funerary set, is fragmented, with the exception of a ladle and a miniature jar. Moreover, also a few fragments of columned lithic cippi were recuperated. Hypogeum tomb proceeded by an underground corridor and accessed through an arched entrance without its stone slab closure, removed by the violators. The excavation of the access corridor has brought to light, in secondary context, an intact columned and a fragmented lithic cippus. The indoor environment, with a rectangular plan and a low vaulted ceiling, was converted into a single deposition platform right of the walkway, while on the left wall is a small niche. The room, violated only in its superficial levels, housed at least three depositions: the first was probably on the platform, but did not feature any bones; the second was found intact at the end of the walkway, where were found parts of a skull, a jaw and the femurs and tibias of a young individual (18/25 years old) together with his grave goods (two small jars, a bowl and a small black painted jug). Lastly, the third deposition, which belonged to an adult positioned with its head towards the entrance of the room, occupied the walkway and was covered by a stone slab and other stones. The grave goods yielded an inside red painted pan. This last deposition testifies a prolonged use of the tomb until the early Roman Empire, which appears to be confirmed by the presence of fragments of Terra Sigillata pottery and by a balsam jar of blown glass. Underground chamber tomb with an access corridor with steps, at the end of which are two entrances, one in front and one on the right wall of the corridor. The latter leads to a small environment of rectangular shape, found still sealed by two overlapping tiles used for its closure. The grave goods were very few, probably related to a single deposition, among these a small black-painted jug and two achromatic ceramic jars. The front entrance, which still has its stone slab sealing, introduces to a room with a rectangular plan in which the ceiling is collapsed, probably due to violations. The central walkway is S-shaped and it separates two deposition platforms, which are divided into loculi and benches. Near the entrance are realized two other loculi in the vertical wall of the deposition platforms, used for a re-deposition of bones, and a niche containing a cinerary urn. Two further loculi, obtained in the front part of the walkway, raises the total count of depositions in the room to twenty-five. 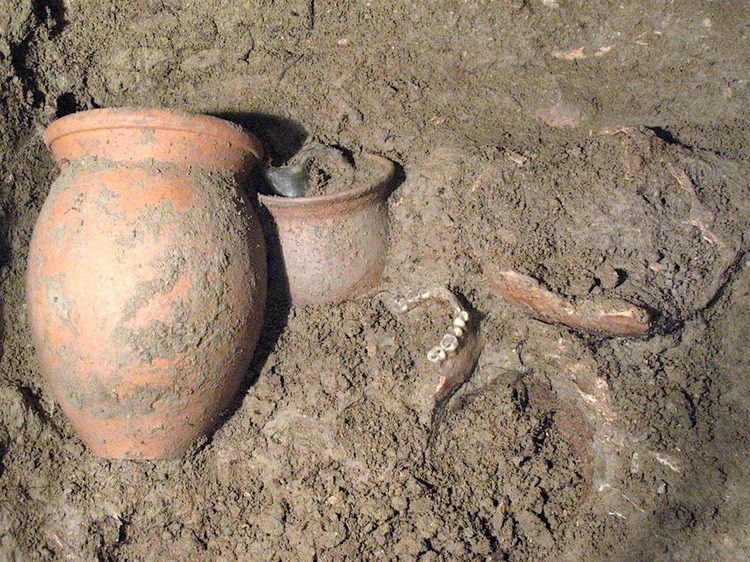 The grave goods, mostly fragmentary, include achromatic, black painted and red ceramic kitchen pottery (jugs, cups, bowls, plates), metals (a coin and a bronze mirror, a few fragments of iron strigils) and blown glass (balsam jars). The presence of a black painted oil lamp, south-Etruscan type, of a fragment of a matrix oil lamp with a representation of Pegasus and some fragments of clay theater masks, whose presence is already attested in funerary contexts of Tuscania and Tarquinia, is rather significant. 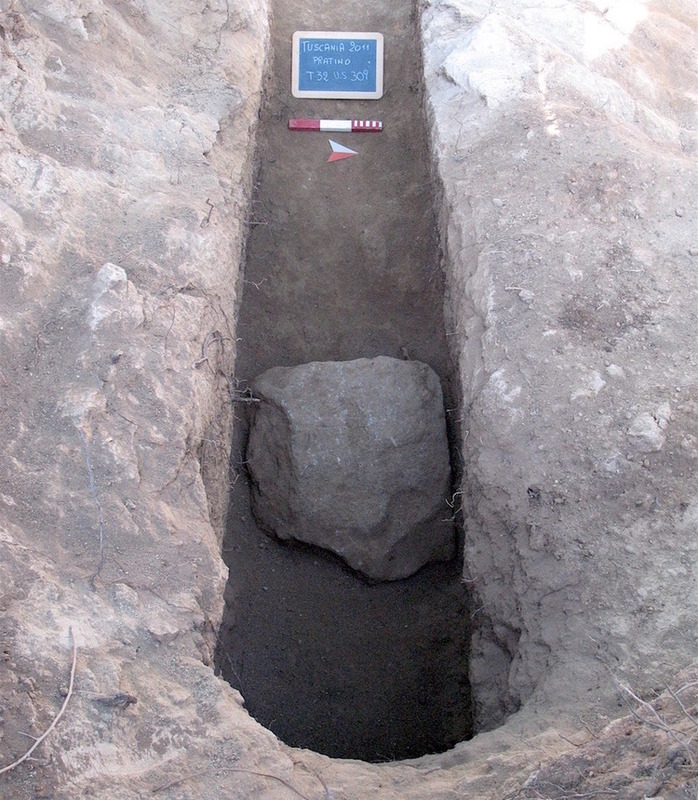 Vertical shaft tomb, found intact and sealed by two large tiles positioned side by side, presenting a plan of deposition bordered by a curb and preceded by a narrow external walkway that housed a columned lithic cippus. 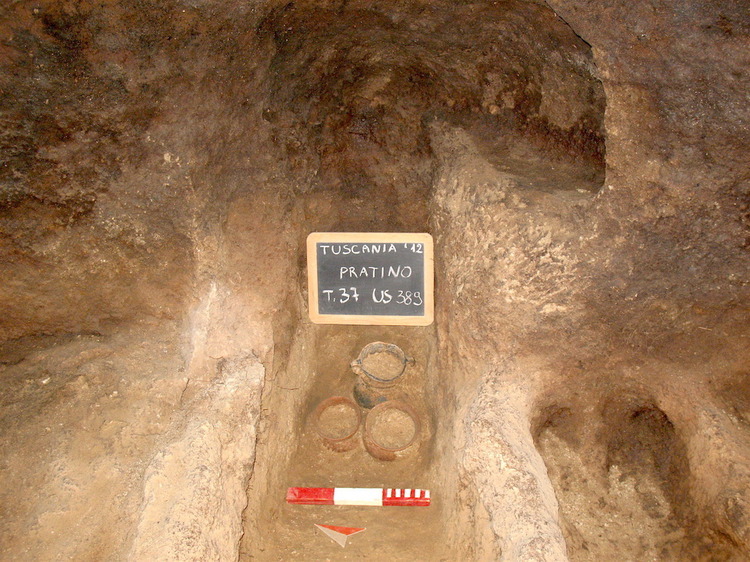 The grave goods are related to a female individual around 30 to 35 years of age, and included achromatic ceramic elements, as three jugs and a small jar, a red painted pan and seven blown glass balsam jars, one of which is preserved only in its bottom part. 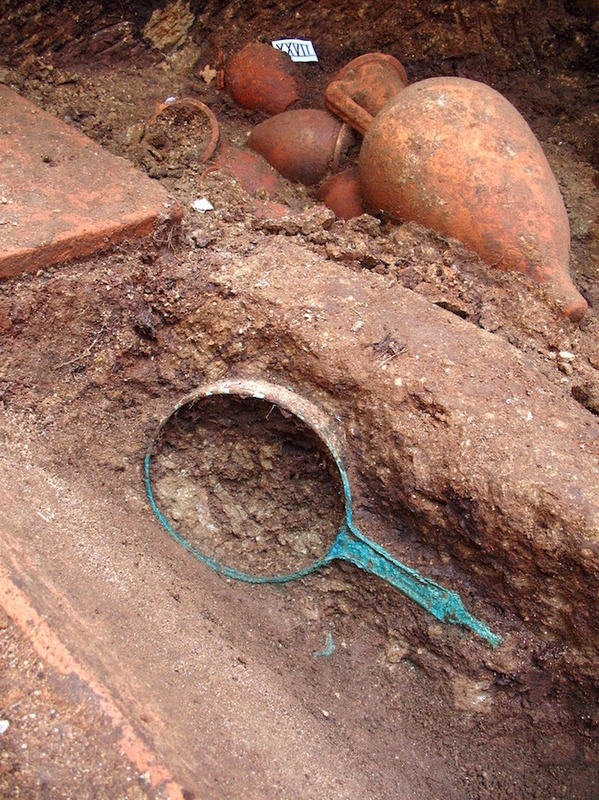 The retrieved materials allow us to date the grave to the early Roman Empire, witnessing a later phase of attendance and use of this sector of the necropolis. Rectangular pit grave with rounded short sides. The deposition, partly covered by a piece of tile found inside, featured only a single element of its grave goods, an achromatic hemispherical ceramic cup. The size of the tomb and the exiguity of the funerary set, leads to the hypothesis of a child burial. Tomb 37 is an underground burial chamber with an open-air access corridor. 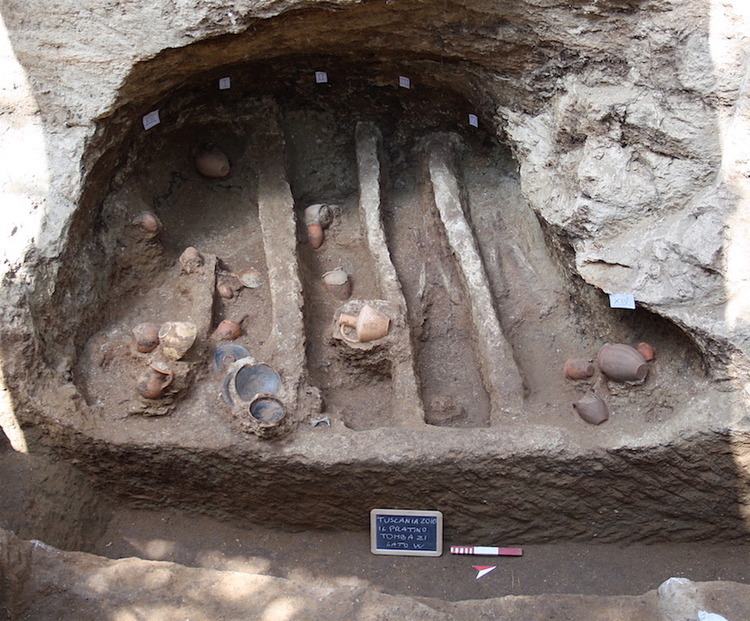 Although partially violated, a fair amount of grave goods was discovered in specific areas. 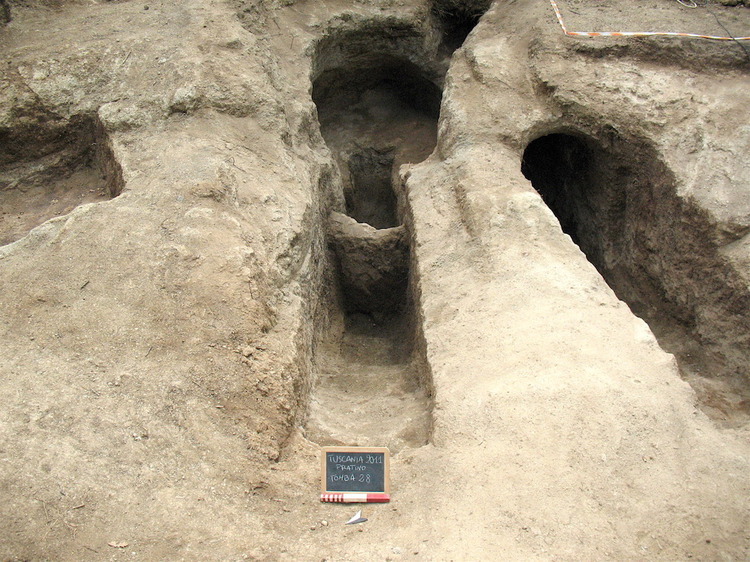 A short shallow corridor leads to a small chamber with a coaxial inner walkway and platforms on both sides, which housed three inhumations. One of the stone slabs that closed the entrance is still visible. The East platform has two semicircular headrests on the South side. In the rear wall there is a small niche, probably used to hold one or more cinerary urns. On the Eastern platform a few bone fragments and a fragmentary bronze mirror with incised decoration were unearthed. On the floor of the inner walkway a group of five ceramic vessels was found: a black-glaze cup with two vertical handles (kantharos) used as a lid for a two-handled jar and three achromatic pots. On the sides of the access corridor are present two intact individual burials. The ceramic vessels found here are less than twenty, mainly achromatic pots, one balsam jar with painted linear decoration and two small black glaze jugs (olpai); also a bronze coin and a small amphora were brought back to light. Tomb 47 is a small underground chamber with an access corridor; the ceiling is not preserved. On the sides of a short walkway there are two platforms; only few fragments of the original grave goods escaped the violation.